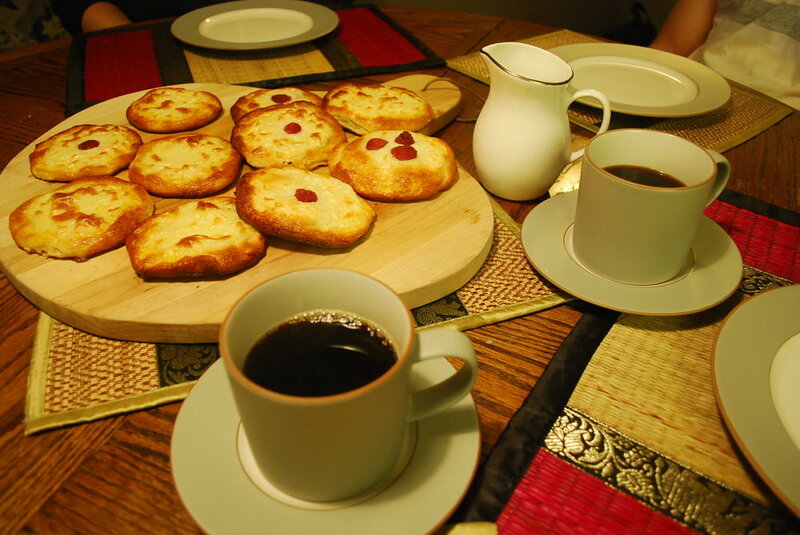 Vatrushka are a pastry from Eastern Europe commonly filled with a sweet cream cheese mixture or mixed dried fruit. 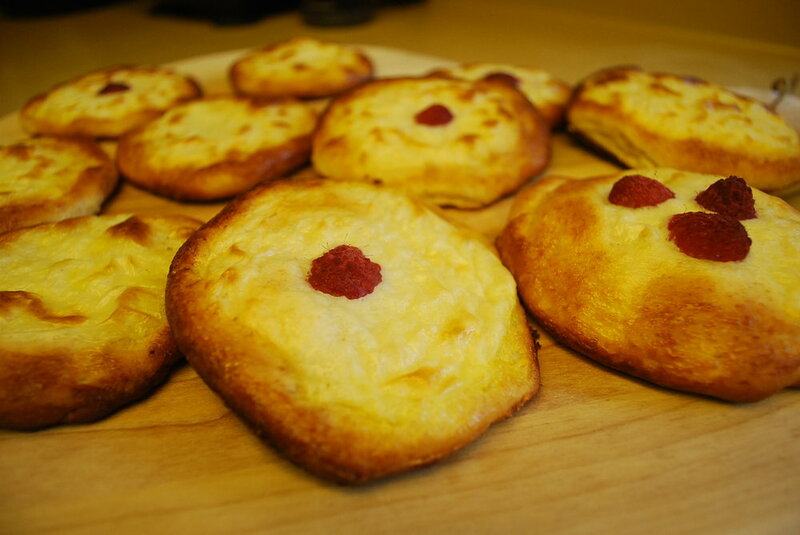 Generally they are made with a sweet yeasted dough, but can be made savory. Lovely with a cup of black coffee for breakfast or dessert. Heat the water to 110°F; add 1 Tbsp. of sugar, yeast, and ½ cup of sifted flour. Stir well, cover, and leave in a warm place for about an hour. The mix should develop a lot of bubbles and rise. Separate the egg white from the yolk. Save the yolk for later in the recipe. Heat milk to 110°F and add to the mix. Stir in the egg white, salt, and the remaining 1 Tbsp sugar. Gradually add sifted flour while stirring in one direction (a wooden spatula is preferred). When the dough becomes too dense to stir with the spatula, start kneading it by hand while adding small amounts of flour at a time. You will want to work the dough until you get a ball of dough with a smooth surface that has just enough flour to prevent it from sticking to your hands. Don’t use more flour than necessary! Cover the dough and let it rise in a warm place until it doubles in size. After that, press it down and let it rise one more time. Dust your work surface with flour and roll out the dough into a sheet about ¼ inch thick. Cut out circles about 5 inches in diameter (you can use a tea saucer for that). Place 1/2 – 1 Tbsp. of filling in the middle of each circle (the exact amount depends on your vatrushka size and your personal preferences). Do not overfill! Carefully roll up the edges making neat, smooth, and even walls about 2/3 inches in height. Even make them a bit higher if you are afraid you are overfilling. Carefully smooth the surface of the filling making sure it is even and fills the entire space. Turn on the oven to preheat it to 425°F – 450°F. Lightly grease a baking sheet or pan. Arrange vatrushkas on the baking sheet some distance apart so they don’t stick together when they expand. Let your vatrushkas stand for about 15 minutes in a warm place. Meanwhile, melt the butter without making it hot, and mix it with the saved egg yolk. Stir very well and remove any clumps. After vatrushkas have been rising for 15 minutes, carefully brush a thin layer of the egg yolk/butter mix on the top and most importantly, the dough portion of each pie. Let vatrushkas stand for another 10 minutes and carefully puncture the top in 2-3 places with a fork without puncturing all the way to the bottom. Place them in the oven. Baking time will vary but it usually takes 15-25 minutes to obtain a smooth brown crust. After the baking is finished, immediately place vatrushkas on a wooden board or wire mesh for cooling. Let the vatrushkas cool for at least 15 minutes before serving. This is important for full flavor development. I have been trying my hand at baking bread recently and that has been absolutely magical, maybe I should stick with the savory? Nah. I'm not dissuaded. On to the next challenge!